When I founded the company in 2003 I was able to say: Emsisoft is an “Anti-Trojan” company, or at least an “Anti-Spyware” company, as that was the more common term back then for all programs that were not specifically “Antivirus“. Over the years though, my team and I found that this definition was probably too narrow. In 2008 we decided to add a second scanning engine to our own technology, whereby the worldwide recognized definition of a typical antivirus product was met by our flagship product. But honestly, it felt wrong using the word “Antivirus“. Our recorded statistics of the actual threat findings clearly indicated that viruses made up less than 5% of the total infections in 2008. So we started to think about ourselves more as being an “Anti-Malware” company and even named our flagship product accordingly “Emsisoft Anti-Malware“, since Malware is the official term that covers all types of threats for your computer. Interestingly, most of our competitors still use “Antivirus” for their products, despite the fact that this is basically wrong. Even the well known Internet security testing agency AV-Comparatives recognizes that. During the last year or so, the threat landscape that our malware analysis experts face has shifted significantly. I was quite surprised when I checked the latest infection statistics recently and compared them against the last few years: it seems we have literally become an “Anti-PUP” company! In this table you can see what percentage of malware infections consisted of PUPs. In 2012, PUPs made up only 25% of all malware infections, and you can clearly see how that percentage rapidly increased within a few years! 79% of all infections that Emsisoft removes are PUPs! After I verified the database query on our database three times because I couldn’t believe the data, it became clear to me that we did not only remove the incredible total of 2,534,673 malware infections in January 2015 (+ those that were not reported back to us), but also that there is something very very wrong in the freeware software industry when 79% of all infections that we detect are PUPs nowadays. When there is a nuisance, there is a solution too. We at Emsisoft have always kept high ethical standards. 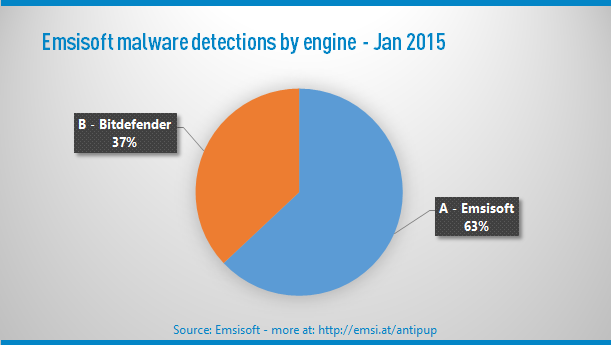 While many antivirus products today don’t detect most of the PUPs and in fact install PUPs themselves directly with their own products, Emsisoft has received quite a bit of recognition of doing a great job in removing them efficiently. In conclusion, while the product name “Emsisoft Anti-Malware” remains valid, we should see ourselves mostly as an Anti-PUP company today. At the moment it is very unlikely that the trend of adding unwanted stuff for cash to freeware products will end soon. Unfortunately it has become a major business model to finance development of free software. So be careful when downloading stuff and follow some basic rules to avoid infections of PUPs. We will continue the fight against PUPs, their creators and those who spread them. Have a nice (PUP-free) day!